On 17th May 2014, SEKAS (South East Kent Astronomical Society – www.sekas.co.uk), the astro society of which I am a member, held a public observing session at Western Heights in Dover. It was an opportunity for the public to come along and see some fantastic astronomical sights, from solar observing during the day to some more standard astronomical observing at night. I decided to take along the imaging setup and do some planetary imaging, as Jupiter, Mars and Saturn were all putting on a show that night. 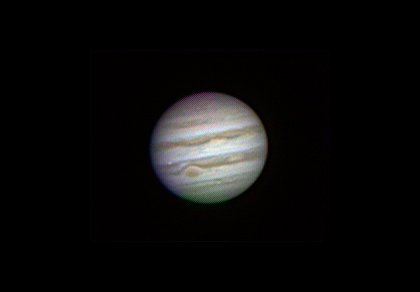 Jupiter was of particular interest, as it was the first time I’d had a chance to try and properly image it since I got the new planetary camera – the ZW Optics ASI120MC. To the left is the fruits of the efforts on Jupiter. The night wasn’t as clear as I’d hoped it would be, with a lot of haze hanging around robbing us of some detail. Nonetheless, I managed to get a good image of Jupiter, with the Great Red Spot showing up well. Also on show in this image is Io, one of the moons. This time, it’s actually visible to the top left of the Great Red Spot – as a little off-white dot. This is the first time I’ve managed to capture one of the moons crossing the face of the planet, and it actually be visible in the final image. This is the best 4000 of 8000 frames, stacked in Autostakkert2, sharpened using wavelets in Registax, and the finished off in Lightroom. This, and all of the images on the page were captured through the Skywatcher 200p Netwonian reflector, on the HEQ5 mount, with a Revelation Astro 2.5x Apochromatic Barlow lens. 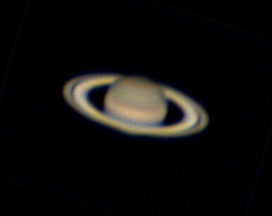 I also had a go at Saturn, but it was so low, and the murk so thick over the English Channel, that the results were less spectacular than expected, but I was still happy with it. Same settings and processing as above. After Saturn, I finally turned my attention to Mars. A nice capture, again with a high haze and not particularly good seeing marring the quality, but with the surface detail and the polar ice cap showing through well. Again, the same settings as above. Its amazing the difference in quality that you get when conditions are not quite right. Unfortunately, the good old British weather can never quite be relied on to behave itself. That, combined with imaging near the sea (at Dover), and a thick murky haze, I’m really pleased I got anything at all. It also shows that even in conditions you don’t expect to get much, the results can still be very good, so it’s worth processing captures that you’re not sure about, and seeing what you can get out of it. The best thing about this being done at a public event, is that as well as the usual visual stuff, which is always fantastic, it provided an opportunity for the public to see some imaging in action. We had a very good selection of people asking questions and curious about what we were doing. the thing that surprised a lot of them was the fact that you don’t need thousands of pounds worth of kit to start doing work like this. This is a heck of a change to even 10-15 years ago, when the sorts of images we’re getting now with amateur kit couldn’t even be obtained using decent pro kit…! The advent of the digital age when it comes to imaging is definitely the thing that’s brought the opportunity to do imaging like this to the astronomical masses. It’s great, and I for one am glad to be able to take advantage of it! Hopefully, a few people will have learnt a thing or two, or been inspired into giving it a go themselves.